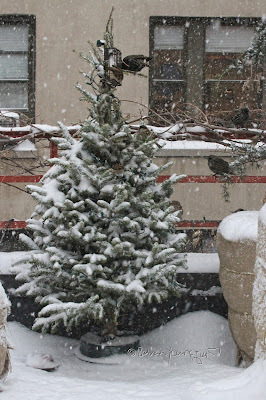 The Last Leaf Gardener: Yesterday's "bomb cyclone." At one point it was so windy during yesterday's "bomb cyclone" (a winter storm that hit NYC with a vengeance), that the "mohawk" of a male cardinal who was visiting my rooftop garden was blowing back and forth. 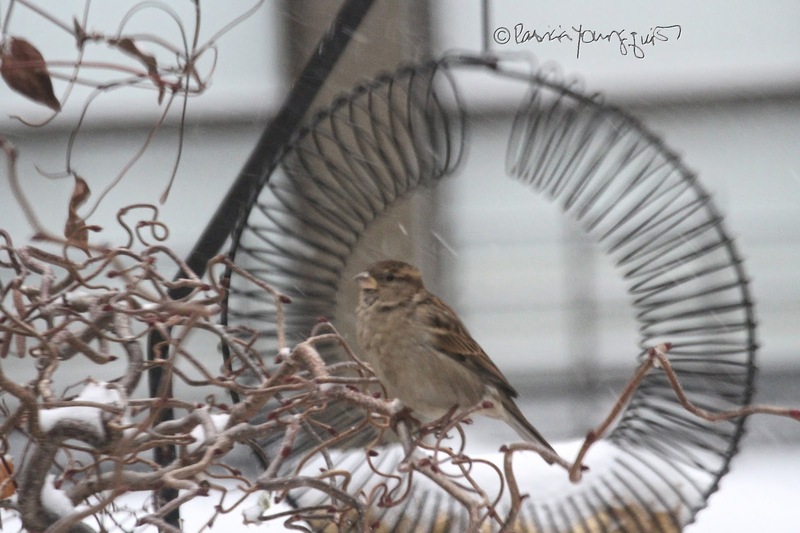 Not even the stiffest hairspray could've helped his situation, as evidenced by the image atop this entry, where he is alighting upon the branches of my kiwi vines, while a lone male house sparrow tries to hold his own in the background. 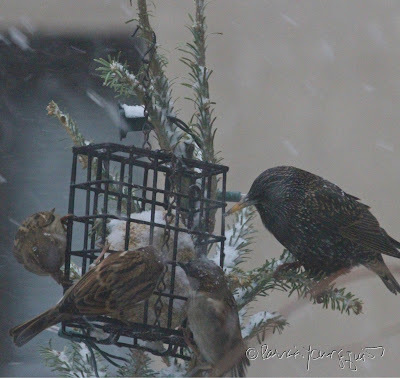 New Yorkers were warned to have essentials on hand, such as "bread and milk," but in these types of weather conditions, what I make sure to have available is nourishment in three of my bird feeders (one that's a house-style, one that's a wreath-style, and one that's a suet cage) for the members of avian community who visit my garden. 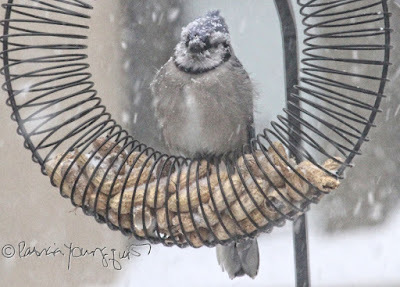 The "house-style feeder" (that accommodates black-oil sunflower seeds*) looks like the a large version of a "house trinket" used in the Monopoly board game, as evidenced in the next set of pictures. 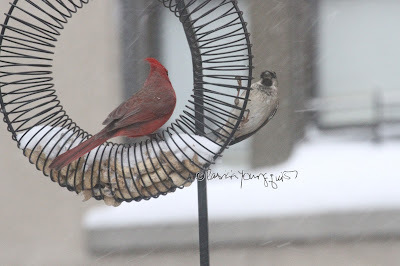 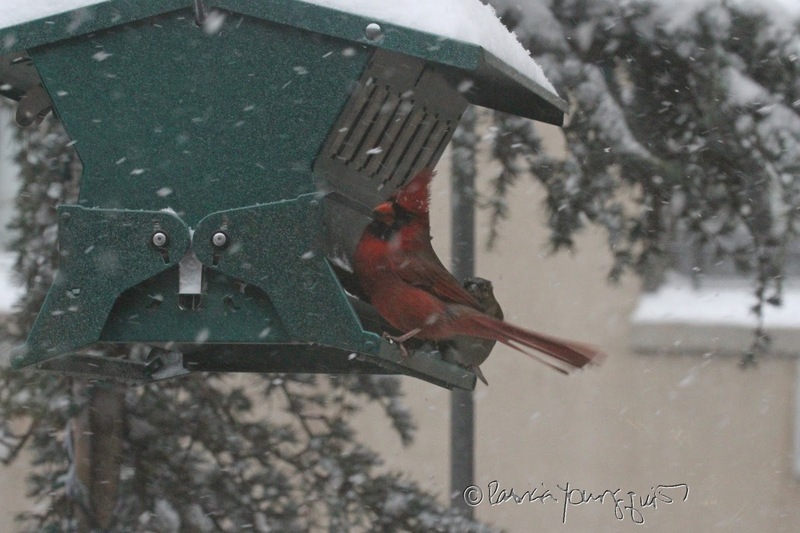 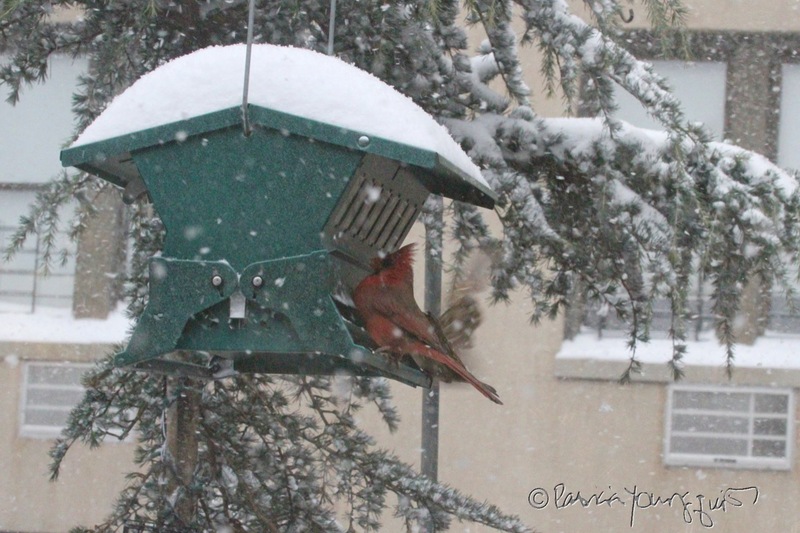 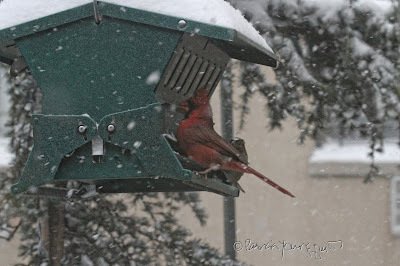 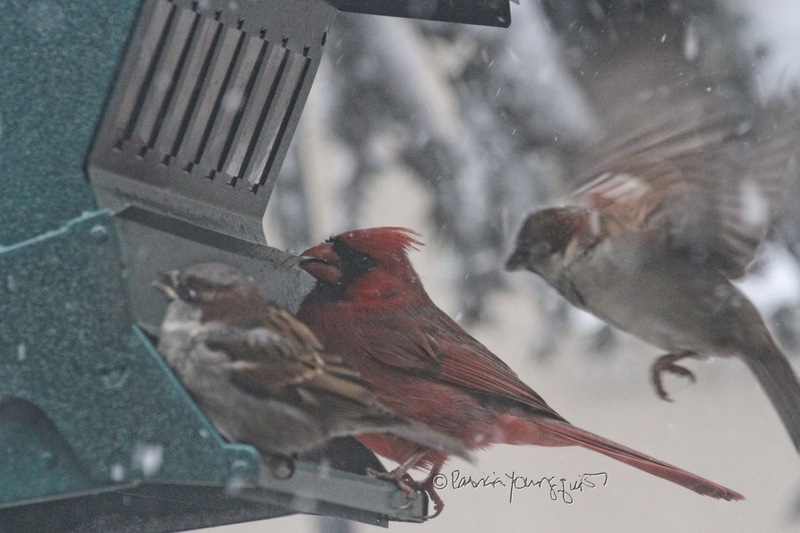 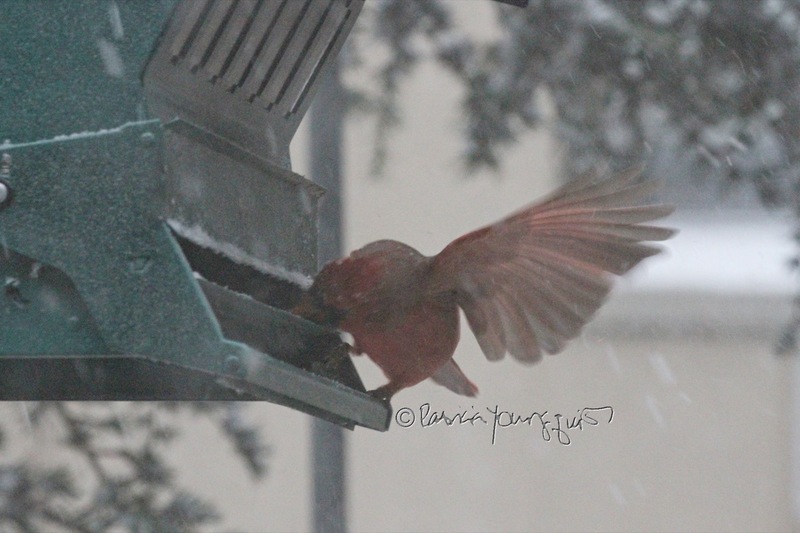 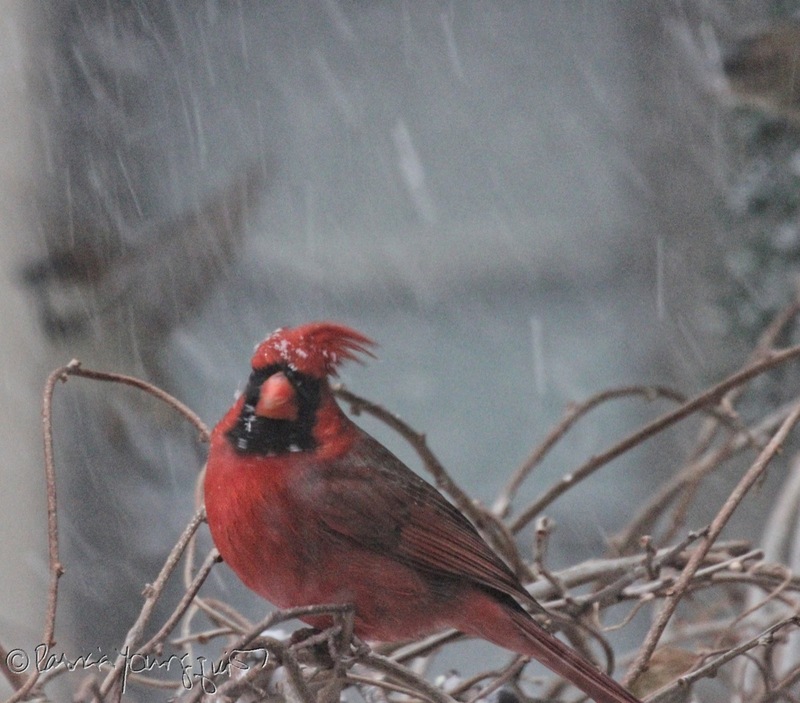 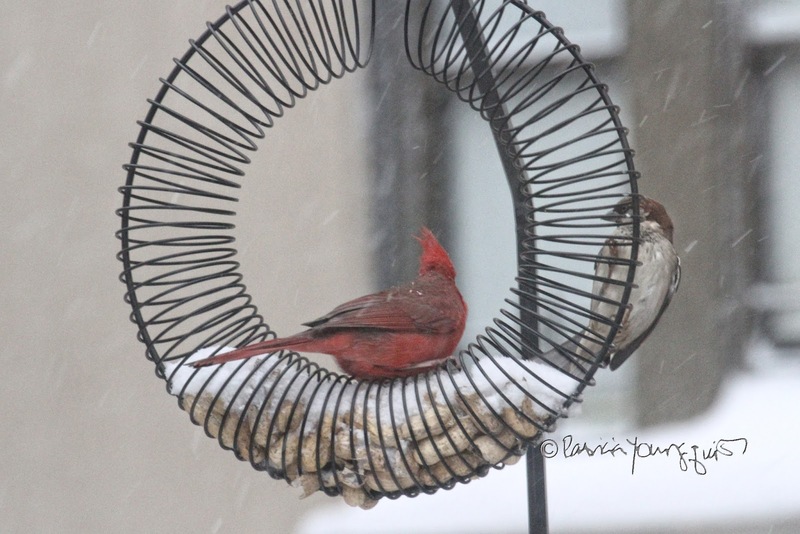 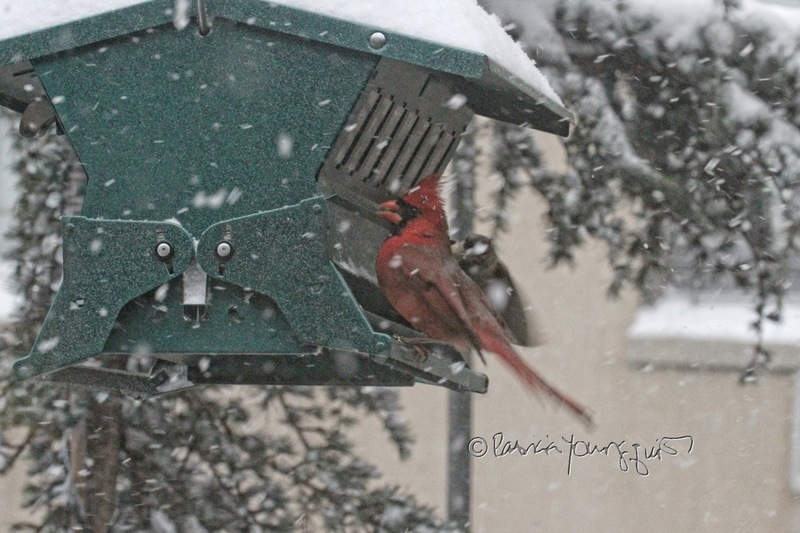 The male cardinal and as well as both genders of sparrows appeared to enjoy dining from there, even when yesterday's snowfall was at it's heaviest. Normally, the house finches who visit here, like to eat from this feeder, but I didn't see a single one of that bird type during the snowstorm. 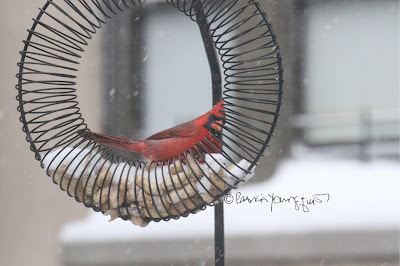 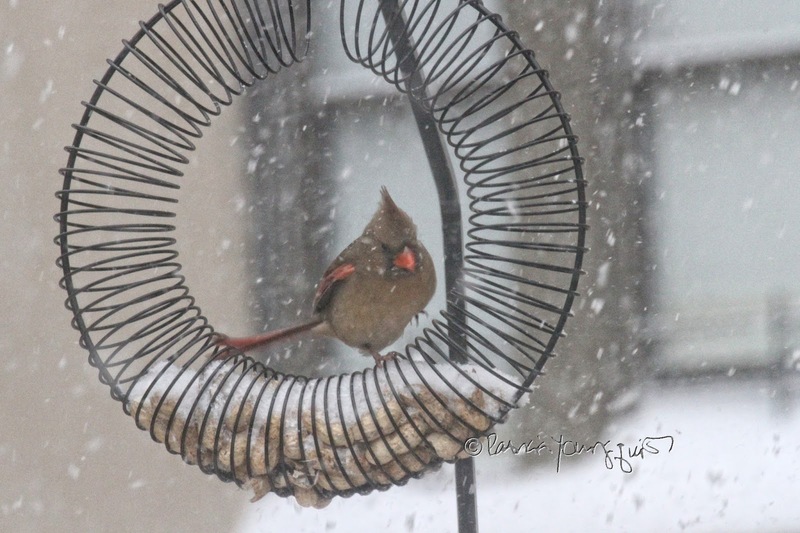 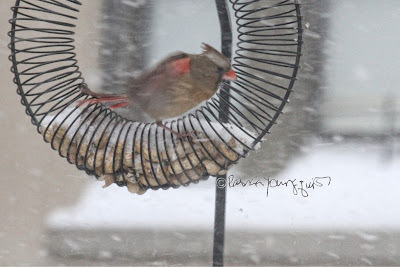 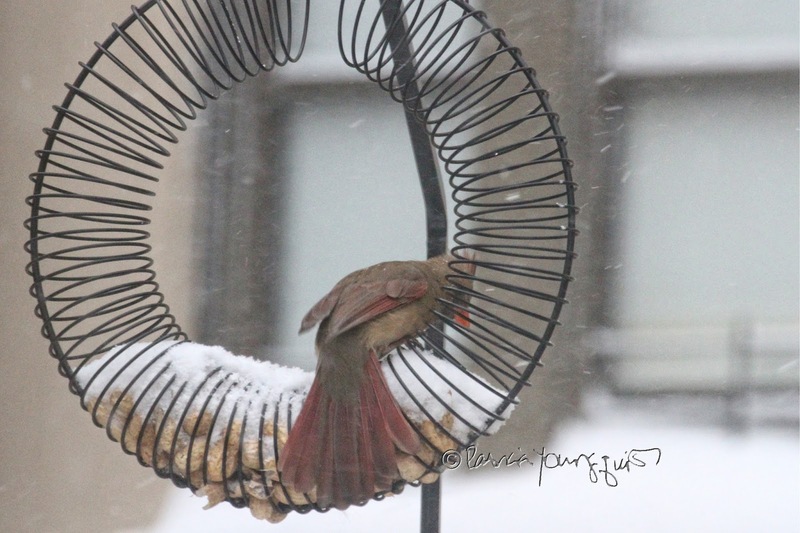 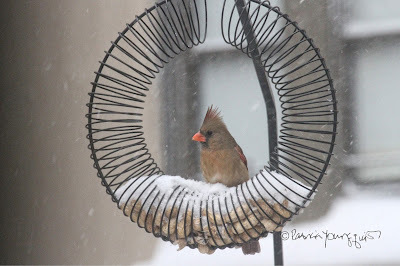 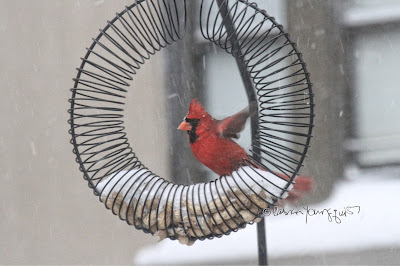 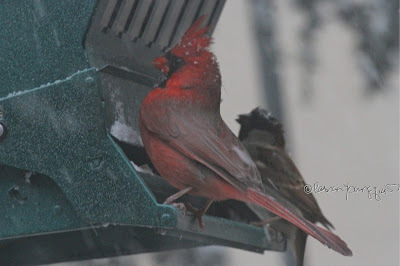 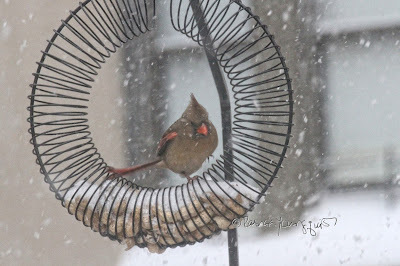 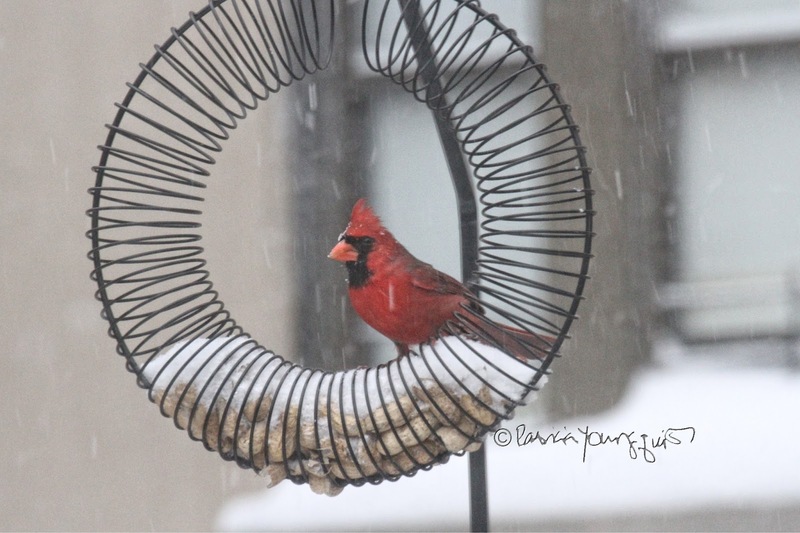 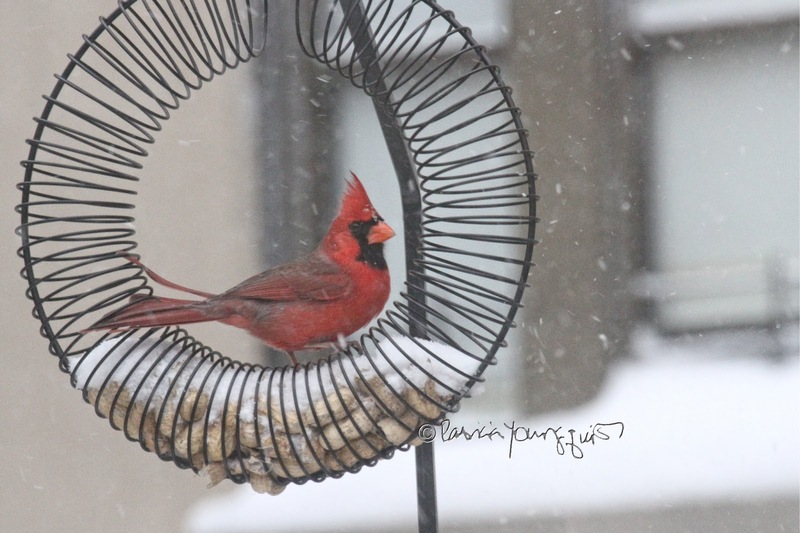 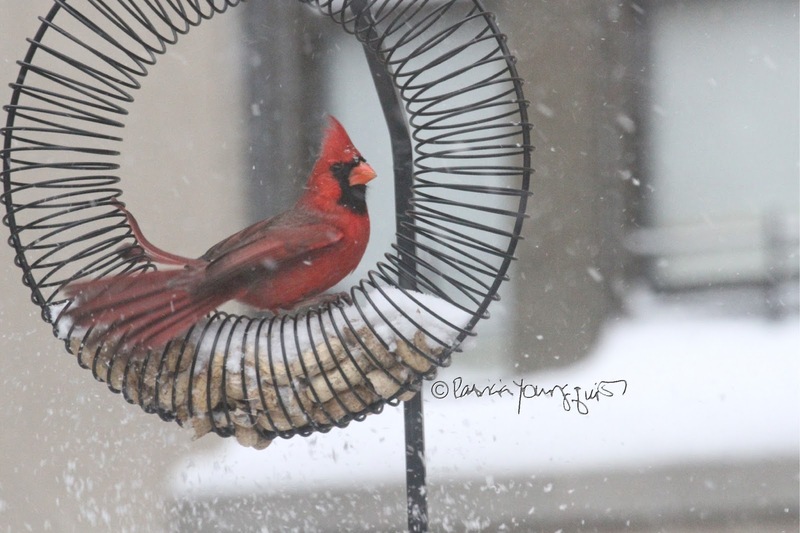 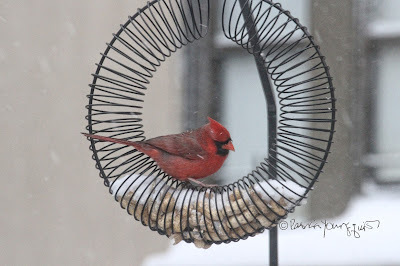 Additionally, under most weather conditions, the female cardinal is a frequent visitor to this feeder, however, yesterday, she spent her time at my "wreath-style" whole peanut feeder, which you can see in the following set of pictures. 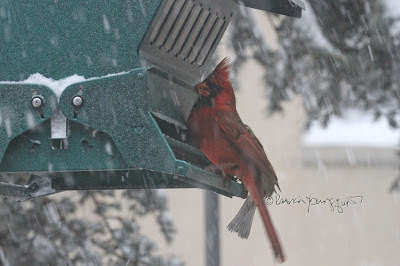 And when the male cardinal wasn't noshing from the "Monopoly-house" style feeder, he availed himself of nourishment from my wreath-style feeder, as evidenced in the pictures below. 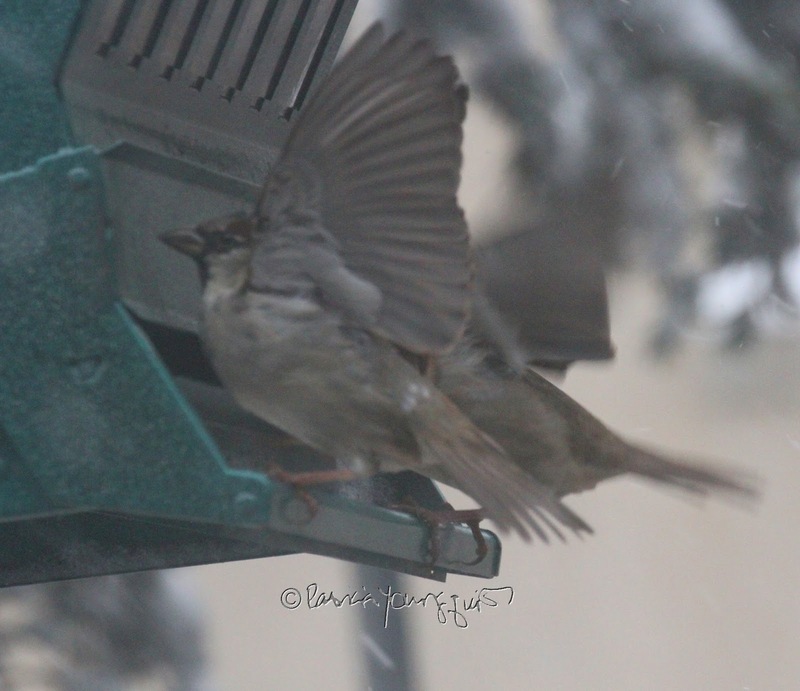 The same was true for the sparrows, in addition to dining at my house-style feeder, they availed themselves of nourishment from my wreath-style feeder, as evidenced in the next few images. 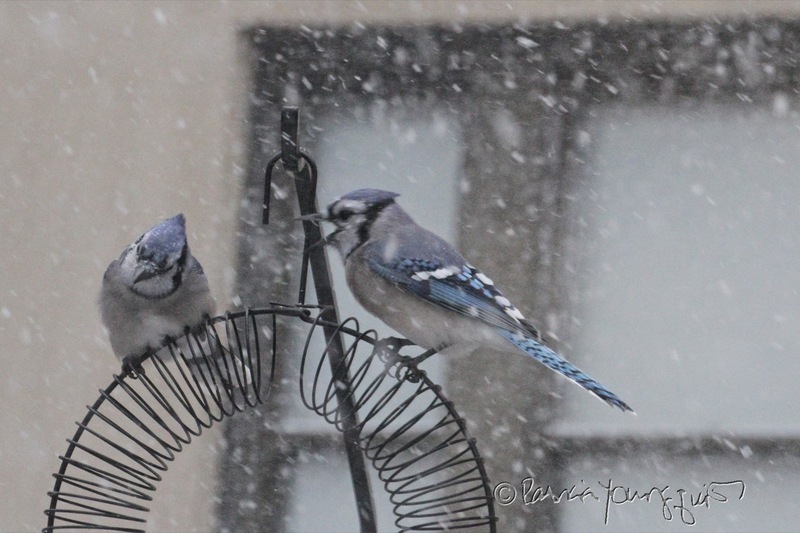 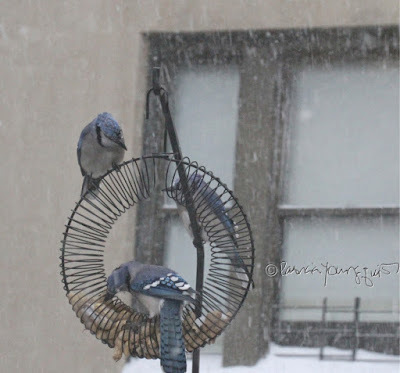 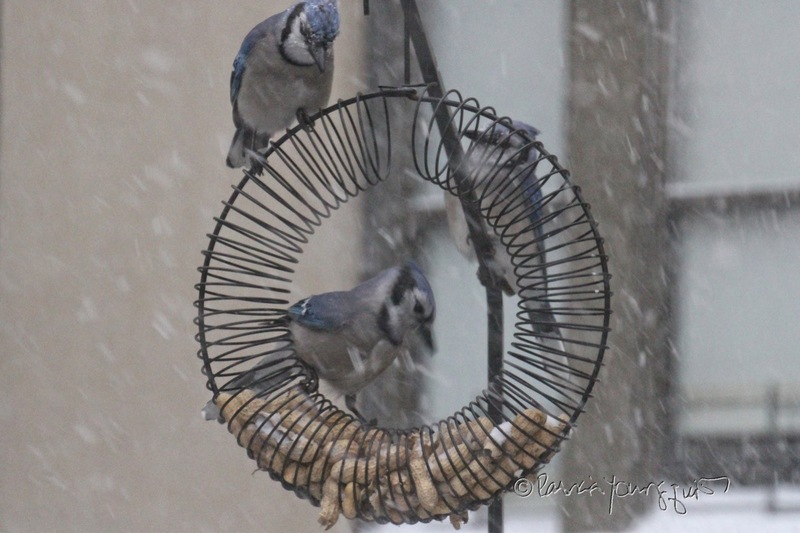 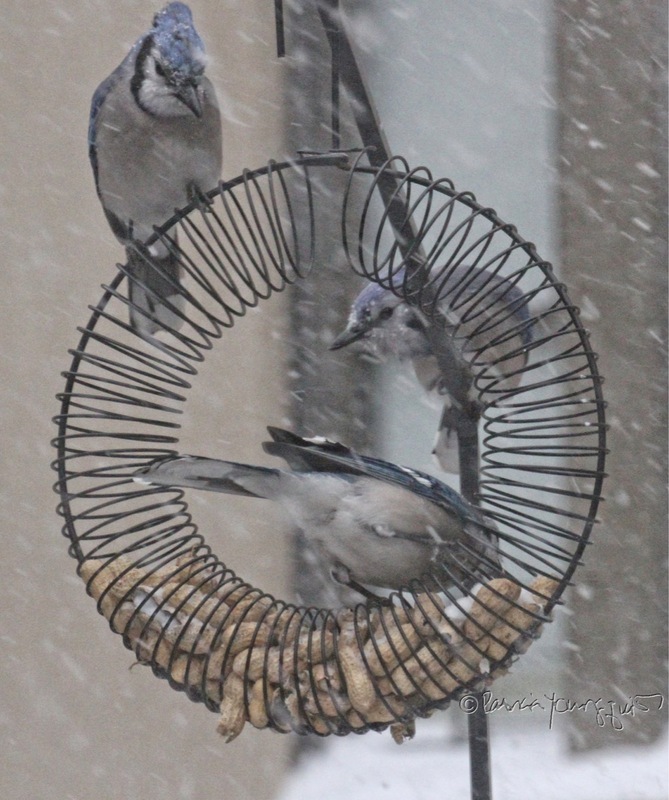 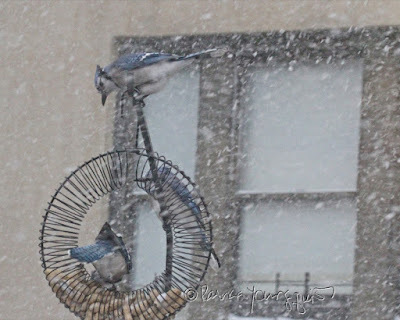 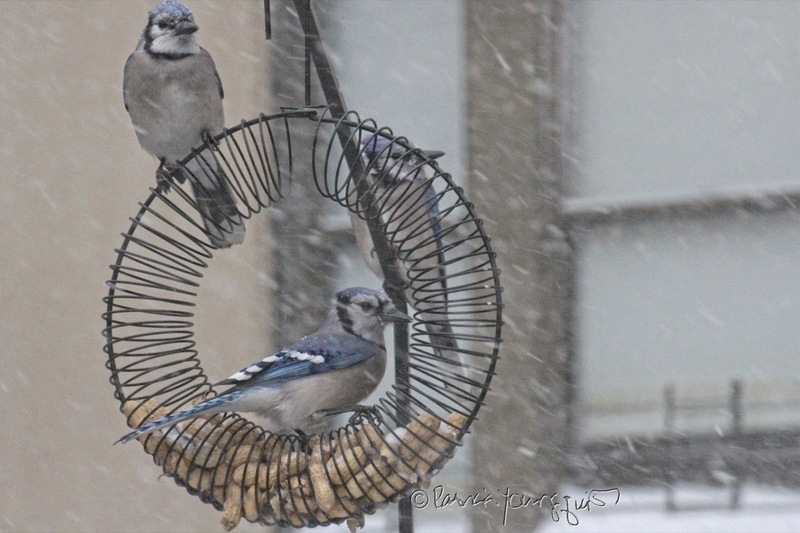 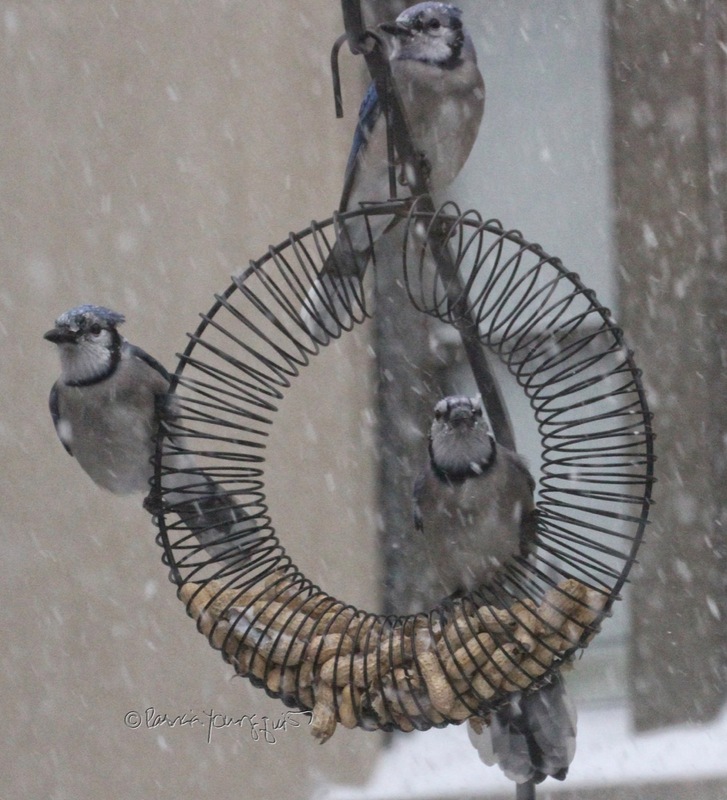 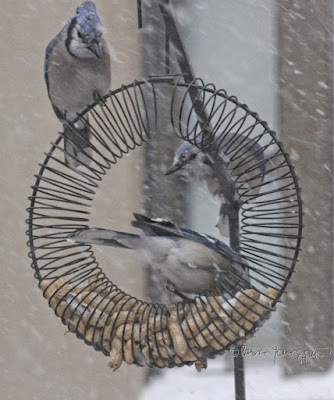 As you might have guessed if you follow this blog, blue jays, also hung out at my wreath-style feeder. 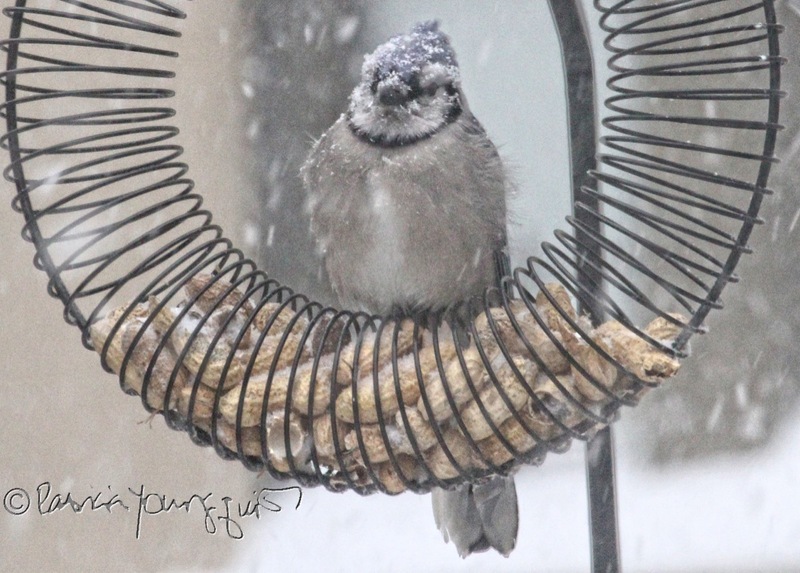 In the first picture below, a jay's face is nearly covered with snow, in the other set of photos, you can see that the jays made a trip — as a family — to my peanut feeder. In addition to some birds availing themselves of nourishment from my house-style and wreath-style bird feeders, some took advantage of my suet-cage feeders. 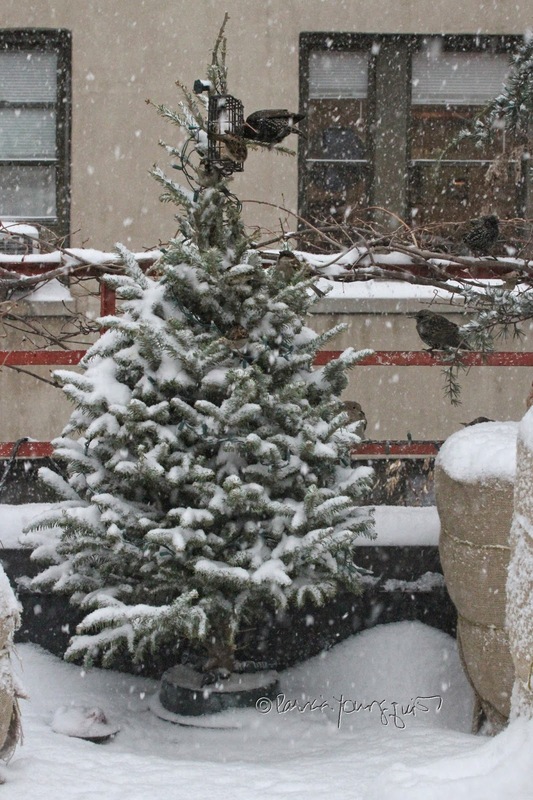 One of my basket-style suet feeders is hanging on my rescue Christmas tree and European starlings and a lone blue jay can be seen enjoying food from it in the next set of photos. 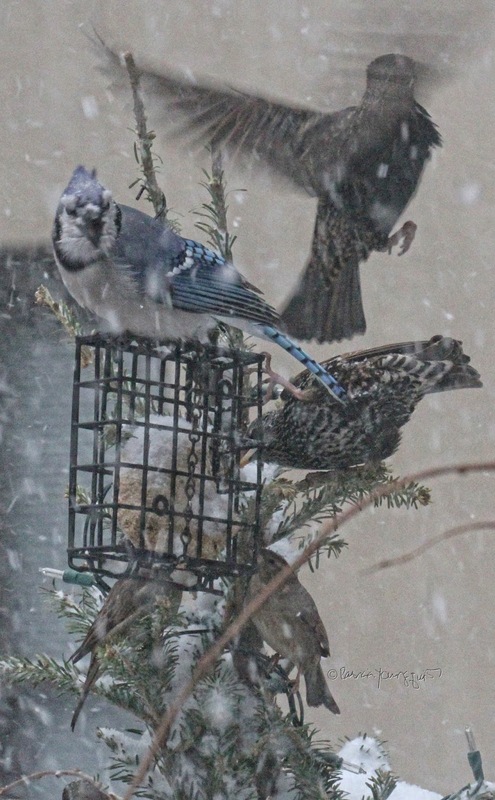 And, there you have it dear reader, the "story" of how a number of wild birds found nourishment in my garden during yesterday's "bomb cyclone." 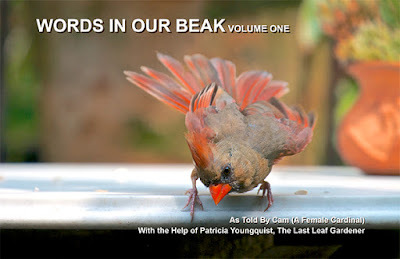 *REFERNCES: I made a quick reference towards the beginning of this post to black-oil sunflower seeds, they are one of Cam's favorites, as mentioned in all versions (hard-cover, soft -cover and digital) of her book, Words In Our Beak Volume One. 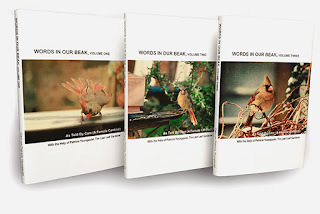 Today, January 5th, is a good time to order it as it's National Bird Day, a day which (according to Holiday Insights or HI), "was established by bird activists. 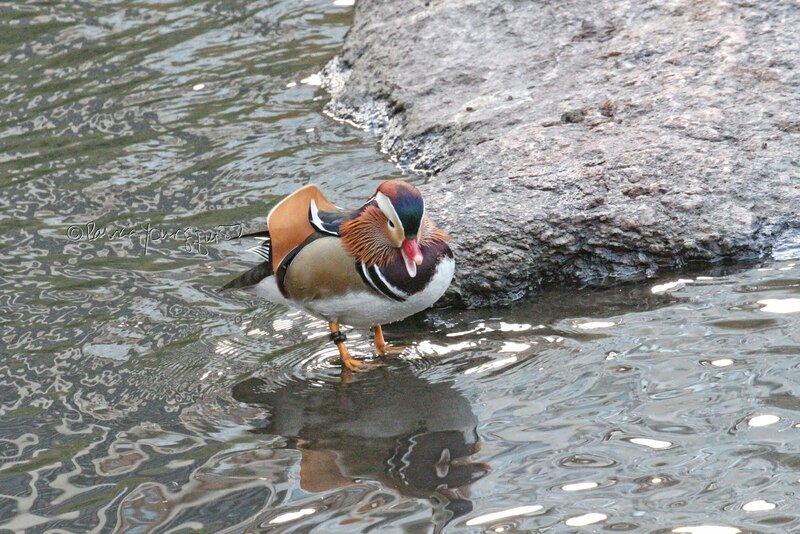 It calls upon people to recognize the plight of captive birds. 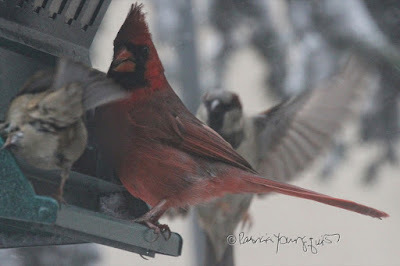 It also draws attention to exploitation of birds in the U.S. pet industry. 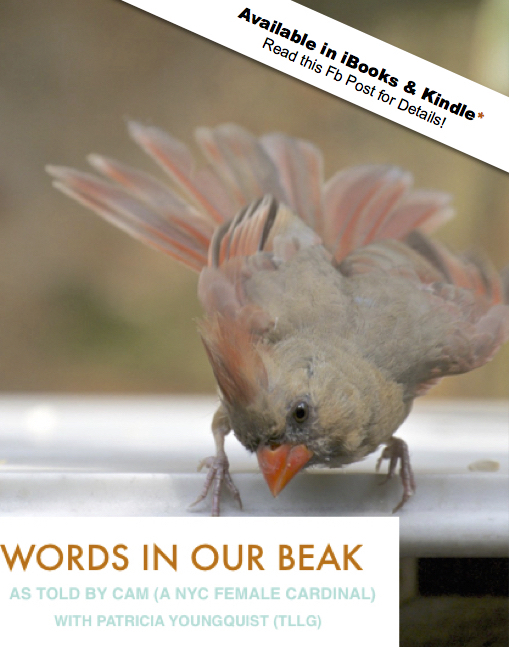 On this day, organizers suggest we reflect upon the conditions of birds held in captivity." HI goes on to suggest that on this day one should "take a few minutes to watch and observe birds, as well as to feed them." 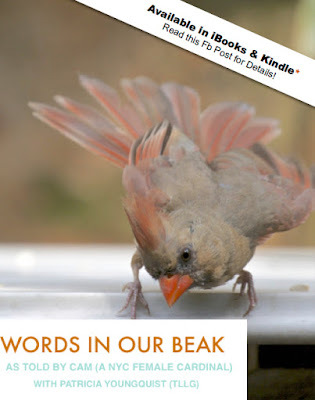 Cam and I agree with HI on this, but we also suggest that if you have not had a chance to get a version of Words In Our Beak Volume One, that you do so in honor of National Bird Day. Moreover, the month of January is a great time to curl up and read a book. 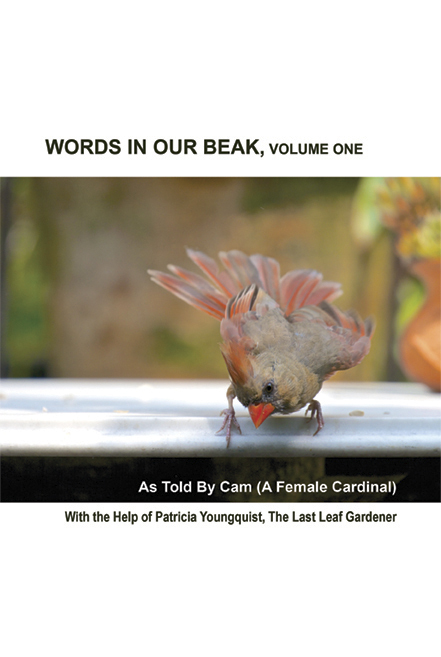 As the writer Jean-Paul Sartre supposedly once said, "To read a poem in January is as lovely as to go for a walk in June," and I dare say that reading Cam's book in January, would be "as lovely as to go for a walk in June."